Today I'm sharing with you a quick project I did on Friday night. I got home from working both jobs and was feeling really motivated so I decided to take everything off my pantry shelves and put everything back in neatly! 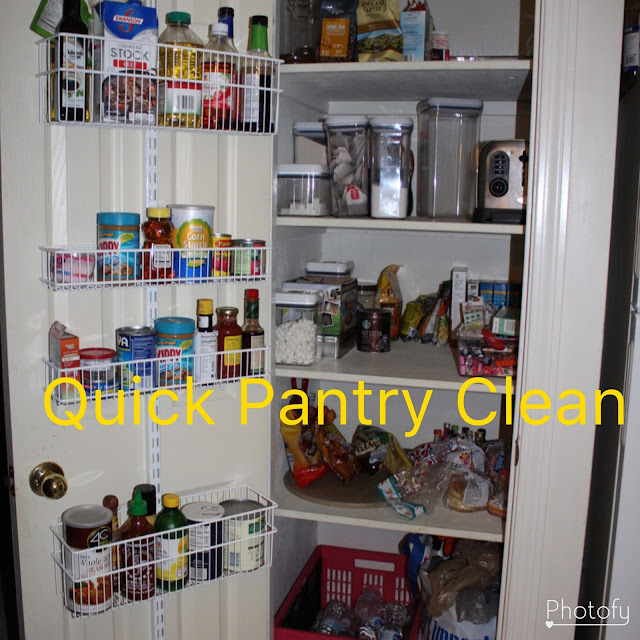 I didn't take a proper before picture but if you head over to my youtube channel you can see a quick video of me emptying everything out of the pantry and putting it all back in. I'm still trying to figure out my Canon Rebel and I think I need to order a new memory card because it got full awful quickly! Anyone out there who uses a DSLR camera who has any tips on memory cards and filming HD videos feel free to send them my way! Anyways, I moved a few things around in the process- our crockpot has been moved onto our blue table in the middle room. 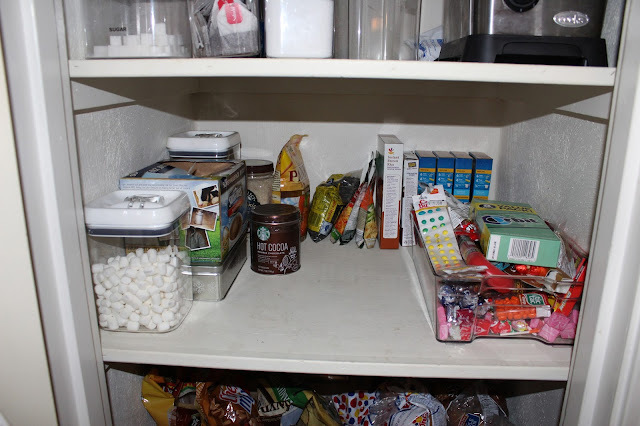 It took the place of Tim's popcorn machine he never uses which was sent into the second bedroom to be stored. (It will be great in a man cave someday!) I also put our blender into the second bedroom to be stored- we hardly ever use it but I feel it's one of those kitchen appliances we need to keep. Our top shelf has all of Tim's coffee on the left. I didn't want to toss anything without talking to him first but we will be going through the coffee since I'm pretty sure some of it is old. I also have some tea samples in the center of the shelf. On the right side is our glass pans for baking. Usually our colander sits in front of this but it was dirty when I took this picture. 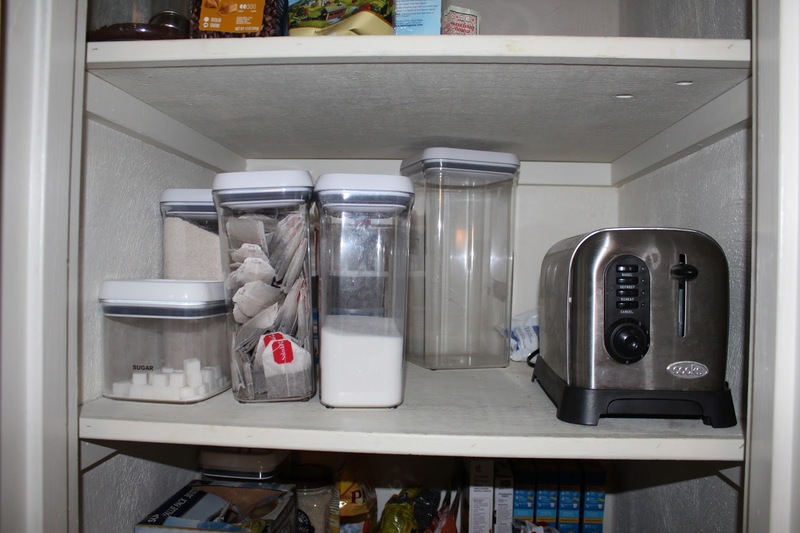 The second shelf holds baking items like flour and sugar but also holds my teabags for my morning tea and the toaster. We don't have enough room on our counter for all our appliances so I tucked this inside the pantry for easy access. In the back is pancake mix and extra syrup, a container that normally holds cereal and some refill Brita filters. Our third shelf holds quite a bit. On the left is some hot chocolate supplies while along the back wall lives all of our pasta, rice, beans and other meal supplies. The bin on the right is full of candy and gum from Christmas. I swear this was empty before Christmas! 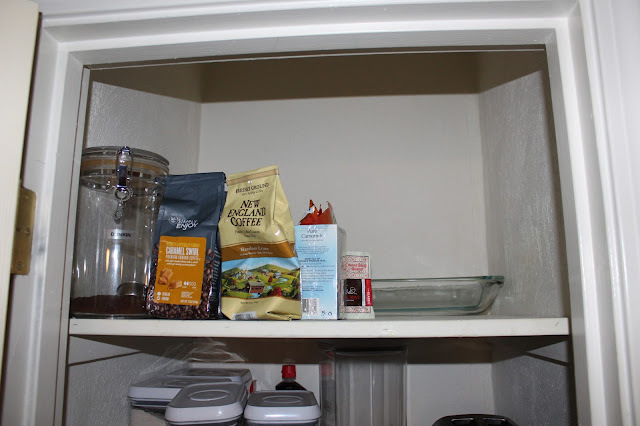 The bottom shelf holds Tim's pizza stone. 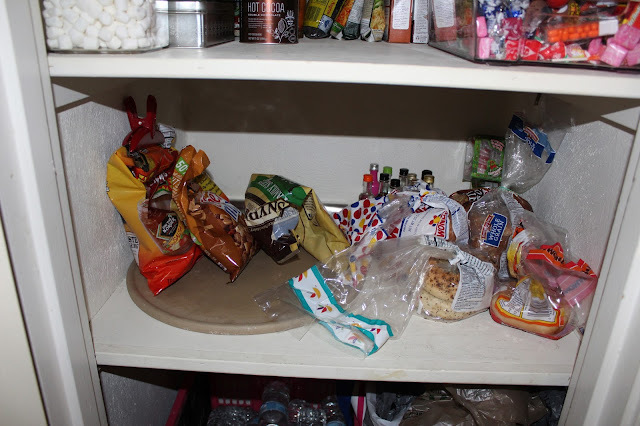 On top of it I placed some snack foods and on the right we have all our bread products. 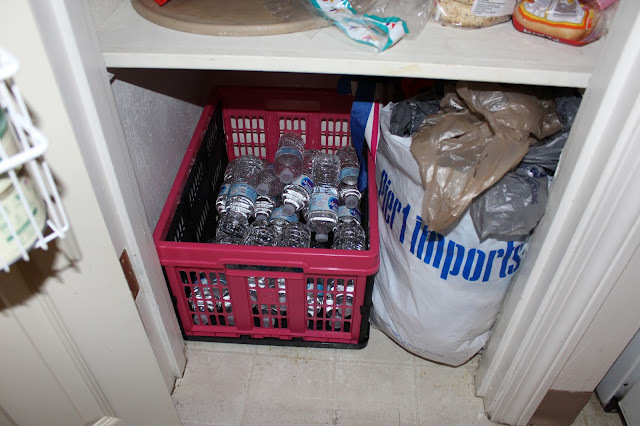 On the floor my pink bin is still working great for holding water bottles and I keep all of our plastic grocery bags on the right side so I can return and recycle them at the grocery store. The door shelves stayed pretty much the same. I did check the expiration dates and everything was still good so I kept everything pretty much where it was. 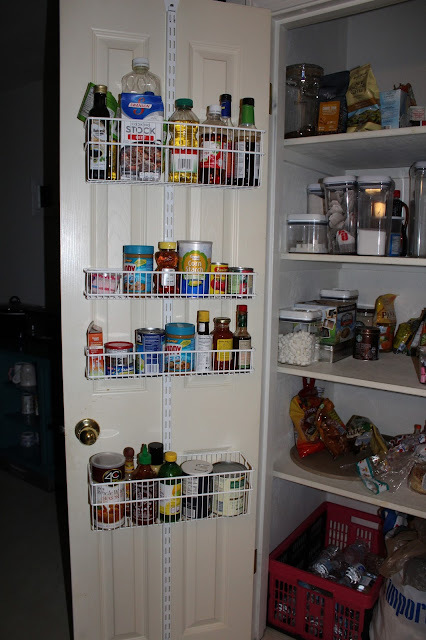 I did throw out a few snack foods that were past their prime but for the most part this is all the same stuff just placed inside the pantry in a neat and organize fashion. Just goes to show you how much of a difference a small tidy can make!